How Much Does a Concrete Block Wall Cost in 2019? Concrete blocks, otherwise known as cinder blocks or concrete masonry units, are commonly used for construction, including foundations, bearing walls, fire walls, retaining walls, screening walls and fences. 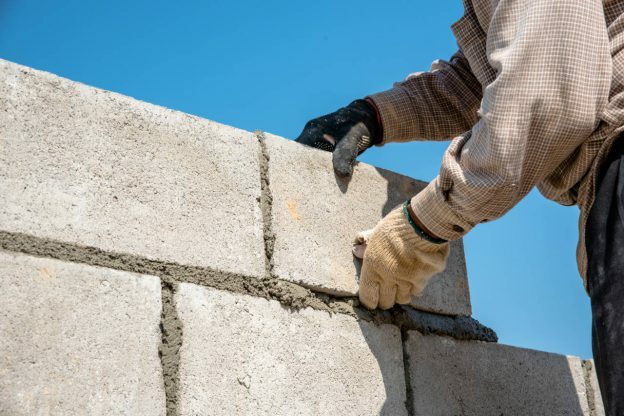 Block walls are usually installed by masons or other masonry contractors and is assembled using mortar and may be filled with rebar and concrete. Several factors may affect the cost of a block wall project and should be considered when estimating the approximate price. Labor variances in different locales can drive the price up or down depending on your area. Some walls need large footings, which should be considered when estimating the cost. Always consult your local building codes to find the foundation requirements for your project. Learn more about the cost of concrete footings. Veneers such as stucco or plaster add a decorative look to an otherwise plain material, but they can also add significant labor and material cost to your project. Paint is another alternative to improve a wall’s appearance, but consider that concrete is a very porous material and will likely take quite a bit of material. Waterproofing coatings such as tar or sealing paint are an important addition for foundation walls, and should also be considered when planning the project. Don’t forget drain piping and other drainage solutions if your installing a foundation. Foundation and structural walls may also need to be reinforced with rebar and concrete. There are many different types of concrete masonry units, and they vary in price with some decorative products costing more than the typical 8″ x 16″ unit. Get estimates from professional masonry contractors to find the exact cost of your project and any other project specifics that might influence the final price.